It's perhaps fair to say that 'Tunc' is one of Booker Prize-nominated novelist Lawrence Durrell's lesser known works. But it's proved to be just as inspiring to the trio of Louis Barabbas, Laura Polence, and Biff Roxby who have formed a new trio as Tunc. Listen to their newly unveiled debut track 'Are You Happy Now?' below. 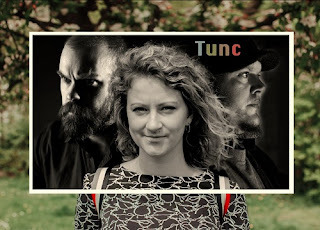 All three members of Tunc have a well established musical history, with Barabbas and Roxby performing together in Louis Barabbas & The Bedlam Six and Polence in Amsterdam-based Snowapple. We've particularly enjoyed the former in the past, even putting them forward to the Glastonbury Emerging Talent Competition ahead of 150 or so other bands back in 2014, alongside Fickle Friends and the duo now known as Ider. Not bad company. Tunc are somewhat confusingly spread across Amsterdam, Salford, and Dunvegan in Scotland, but their hypnotic first song 'Are You Happy Now?' will no doubt pull listeners in from further afield. With its cult-esque repeating opening mantra that echoes the song's title, and its off-kilter sounds, we're bemused, befuddled, and beguiled. An impressive feat. Find more info at facebook.com/tuncband.